After my unexpected success with Golden Beet Soup with Herbs, I considered an even greater challenge: Red Beet Soup based on Miriam Polunin’s Carrot Cilantro Soup recipe. Inspiration, or more correctly motivation, came from the two bunches of red beets we have from our CSA, with another bunch on the way this week. 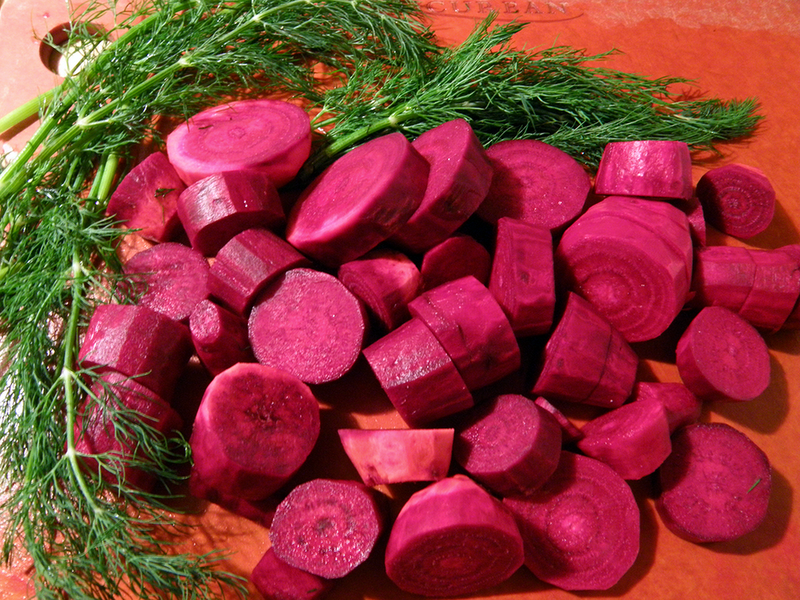 I was not optimistic because red beets are so heavy and earthy compared with carrots and golden beets. They’re stronger in color, flavor, and texture. 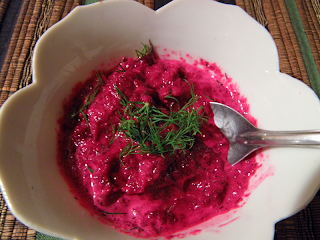 In fact the dill, a classic flavoring for red beets, became rather lost in the color and flavor of the dish at first. Adding more dill plus garnishing with extra dill helped. A milk-based addition, also a classic in red beet soup, helped lighten up the dish in color and in taste. We liked the heartier texture of the red beets; instead of a smooth puree this soup is thick with toothsome mini-chunks. You could cook the beets longer if you want it as smooth as the Carrot Cilantro Soup. 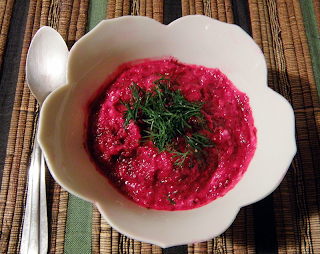 Sour cream is traditional in many red beet soups. I used Lilly fat-free sour cream, made without thickeners or preservatives and with only one ingredient: cultured nonfat milk. You could substitute a thick yogurt. My husband dislikes cultured milk products, so used some fat-free half and half, which was surprisingly delicious. You could choose regular or lowfat half and half instead. I cut the original recipe in half, to use one average bunch of beets. You could easily double it. I used butter, but you could use olive oil, or a butter-oil combination. Beef stock is traditional for red beet soups, but I substituted a Not-Beef bouillon cube (1 cube makes the 2 cups of broth you’ll need). For best results use this or another strong and salty broth or stock. Bragg Liquid Aminos diluted in water would be good. Note the shape of saucepan recommended: deep and narrow. This is to prevent splashes when pureeing with an immersion blender. If you’re using another style of blender or food processor, be wary of staining splashes. Feel free to substitute other herbs to your taste. Oregano, marjoram, thyme, basil, or rosemary might be good. Quantity-wise, remember that rosemary is strongest, and thyme and oregano can also be quite a bit stronger than dill. 1 bunch red beets, about 1 ¼ lbs. Wash and peel beets and slice about 1 inch thick. Cut up large pieces so all pieces are more or less uniform in size, so they’ll cook evenly. Heat butter or oil in deep, narrow saucepan. Add beets and cook over medium high heat for 3 – 5 minutes, stirring up from bottom of pan frequently till beets start to sweat liquid and all surfaces are evenly coated with oil or butter and beet liquid. Mix bouillon cube with hot water and break up. You needn’t dissolve it fully. Add to beets and bring broth to a boil. Reduce heat and simmer for 20 - 25 minutes, till beets can be pierced with fork but not fall apart. For a smoother soup, cook beets until soft, about 30 – 35 minutes. For thicker soup (as I made it), leave the lid off until liquid level is slightly below beets. Meanwhile, wash dill and separate leaves from stems. Chop or snip dill to medium fine. 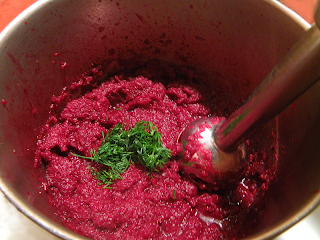 Use an immersion blender to puree the beets and liquid in the pot. I don’t recommend using an immersion blender container, blender or food processor. The beets are still partially hard, and their staining liquid is apt to splash while processing. Using a deep, narrow pot helps to confine things. Puree to the consistency you like, from slightly chunky to super-smooth. Note that super-smooth will only be possible if beets are cooked till soft. Add 3 tbsp. chopped dill and blend slightly, just until evenly distributed. Don’t overblend or you’ll lose all visible dill in the redness. Soup is now ready to serve, with garnishes. Fill individual bowls and add 1 tbsp. or so of sour cream or half and half to each. Alternatively, let diners add their own at the table. In either case, garnish each bowl with additional chopped dill and a grind of pepper. Serve with extra pepper, sour cream or half and half, and dill to garnish. Most people will not need salt, but you might include it for tradition’s sake.